Right now, neither of the two cardigans I'm working on is really portable. This is a problem because every weekday afternoon I have about 40-45 minutes sitting in the Pick Up Line at school, and most weekday afternoons I have 45 minutes of sitting at the gym while Caleb works out. Since I can knit, there's no point in just sitting there like a lump bird, but because I can't really spread out a big project either place, anything with charts or complex shaping where I might be strapped to a pattern just doesn't work. Also, simple designs are easier to knit and talk to other people. Last summer I found the perfect project for portability - the Silky Lace Alpaca Wrap. Now, this should come with a warning because if you're not spending a mind numbing amount of time waiting on a critter to do what critters do, you might poke yourself with a knitting needle just to relieve the monotony of acres and acres of garter stitch. If however, you find yourself very familiar with certain parts of the Pick Up Line or know which seats in the parent waiting area are to be avoided because they eat the parents sitting on them, this might be the perfect project for you. I found it to be so perfectly portable and mindless that I knit two of them last year. The first was for me and the second was for Mindy for Christmas (done in superwash sock yarn for hers - easy care for the non knitter). You are such an enabler! 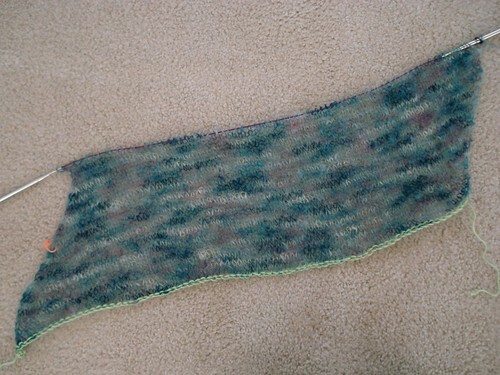 I really like the Mohair bias loop and love the Elann silkin' kydd. I've narrowed my selection down to 7 colors. Now I just have to get realistic! Mitts + Moebius = Matching Set!